More Magic Metropolis Exhibition February 2019, Family Day 22nd February at Stamford Arts Centre, Sketching Workshops and much more….. please see details below! And talking of creativity it is Family Day in Stamford ‘Arts around Town’ on Friday 22nd February, and I hope lots of you, whether you are a family of 1 or 9, aged 2 or 92, will come along to the Arts Centre and enjoy creating your dream building to add to the Magic Metropolis which will grow on the Gallery Wall. Here is the fantastic achievement from last year – a real community masterpiece! It is sleeting as I write, but it won’t be long before Spring, hopefully with a little sunshine, will herald more sketching Stamford Workshops….The next formal five session series commences at Stamford Arts Centre on Monday 29th April, 9.30am-12.30pm, £15 per session (or £60 for the five)… tea and biscuits included..... just bring a sketchbook and pen or pencil. There will be a few informal Monday workshops in March and April too. contact me for further details, times and dates. Above is a selection from a recent workshop…. I’m also looking forward to participating in the Society of Graphic Fine Art (SGFA) 'Paper Works 2019’ Exhibition at RK Burt Gallery in London in April and the SGFA Centenary Exhibitions in Birmingham and Bankside london in May and June ……. more details to follow soon! Please do contact me if you'd like any more information about any of the above, or if you would like to talk about a commission, whether it is to paint a place with a special meaning to you or bespoke illustrations for a particular project you are working on. Do continue below for more information on my forthcoming events and about 'me and my work' and you can also see what I'm up to on Facebook. • 1st - 28th February - More Magic Metropolis Exhibition in the Anteroom at Stamford Arts Centre, St. Mary’s Street, Stamford, PE9 2DL. Open 9am– late, Monday - Saturdays. • Friday 22nd February - Family Day - Arts Around Town ……...help make a Magic Metropolis in the Gallery at Stamford Arts Centre, St. Mary’s Street, Stamford, PE9 2DL. 11am – 4pm. • 2nd -12th April - SGFA ‘Paper Works 2019’ Exhibition at RK Burt Gallery, 51 Union Street, London SE1 1SG. Open 11am–5pm, Monday - Friday. • 29th April - 11th May - WVAS Spring Exhibition in the Gallery at Stamford Arts Centre, St. Mary’s Street, Stamford, PE9 2DL. Open 10am– late, Monday - Saturdays. • ONGOING - Monday Morning Sketching Stamford Workshops - 9.30am-12.30pm based at Stamford Arts Centre £15 per session, commencing Monday 29th April 2019……. though please contact me as there will be some informal sessions taking place in March and April depending on the weather! MORE EVENTS TO ADD - WATCH THIS SPACE! Here are my printed cotton bags . There is a colour, detail picture from my 'Broad Street Market' and 'Top of All Saints' Church paintings, on each side of the bag. The bags are made out of natural cotton (38cm wide x 42cm long x 10cm deep) with long cotton handles. They are durable, washable and are great for the environment. At £8 each they are a great investment as charges for plastic bags are now here. 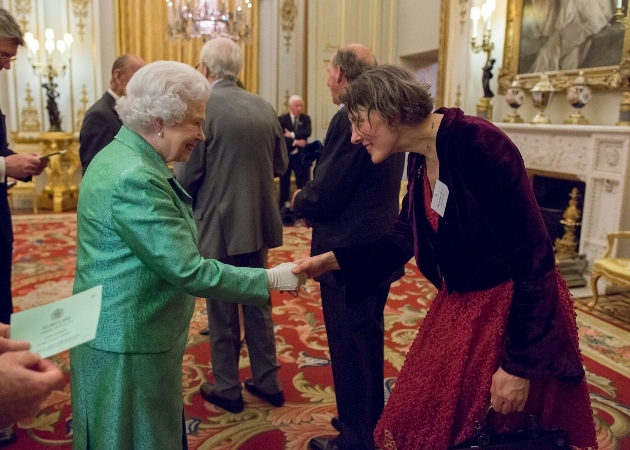 And for now, a shameless 'Look at me, look at me and The Queen!' But it is all in a very good cause. Her Majesty The Queen is the patron of the Winston Churchill Memorial Trust(WCMT) and generously hosted a reception at Buckingham Palace on March 18th 2015 to celebrate the 50th anniversary of Sir Winston's living legacy - the Churchill Fellowships. Being awarded a Fellowship not only enabled me to undertake a journey of a lifetime, it also opened so many doors to wonderful opportunities in my subsequent work, such as commissioning me to produce a painting which we presented to the Queen in 2006. WCMT award Fellowships in enormously diverse subjects, so if you are a British Citizen and passionate about your subject keep this in mind - it could be for you! I’ve kept sketchbooks since leaving school, throughout my architectural studies at Newcastle and Sheffield Universities, subsequent move to London and eventual qualification as an architect in 1999. My sketchbooks have taken me on some wonderful adventures. In 2001 I was awarded a Churchill Fellowship to undertake an artist’s journey inspired by World Heritage Cities and Sites, from France travelling eastwards through eight countries to Nepal, recording it all in the pages of my sketchbook diary. Subsequently I spent time in Cuba, culminating in a solo exhibition of my work at the British Ambassador’s residence in Havana. Closer to home I continued the World Heritage theme with a community project along Hadrian’s Wall. Then in London, I was privileged to sketch in and around the Palace of Westminster and was artist in residence at the Athenaeum Club in 2004. Rather auspiciously I was appointed ‘MCC Young Cricket Artist for 2005’, based at Lord’s Cricket Ground, and subsequently artist in residence at The Queen’s Club for the 2007 tennis season. I’ve had some fabulous commissions. In 2006 The Winston Churchill Memorial Trust commissioned me to produce a painting to present to Her Majesty the Queen. I’ve also worked with Bob Wilson’s charity, The Willow Foundation, sketching in and around Arsenal’s football stadiums. In October 2006 my first London sketchbook diary was published by Methuen, entitled ‘London in Landscape’ with Winston Churchill’s daughter, Lady Soames generously writing the foreword. In 2009 ‘London in Landscape Volume II’ was launched with an exhibition of my paintings in the Barbican Centre, London. Both books are available through Methuen, Amazon, and me. Since 2010 I have resided in Stamford in Lovely Lincolnshire. In 2011, Stamford Georgian Festival, Stamford’s local bookshop published my Stamford sketchbook. And now in 2015 A Fellow Traveller! I hope you enjoy looking around the website! Watercolour Artist London and Stamford.